Freedman Racing :: Another One For Geodesic! "When confidence is up whether it be horse or jockey everything seems to work well," said Mitchell at Bendigo on Sunday - and when both are on a roll, all the better! As was the case with Geodesic who was shooting for a third win a row in the BM64 event, the in-form Jarrod Fry aboard, as he had been for the horse's previous two victories at Sale. Cruising into the straight, Geodesic soon had his rivals measure and over the final stages was drawing clear, his winning margin a soft and impressive 1 3/4 lengths. It was the fourth success of the handsome black gelding's 20 start career, ten of which have been for the Freedman stable. "At the end of his last preparation I thought he was at the crossroads a little bit," Mitchell admitted, spurred on to give him another try by "a bunch of loving owners." 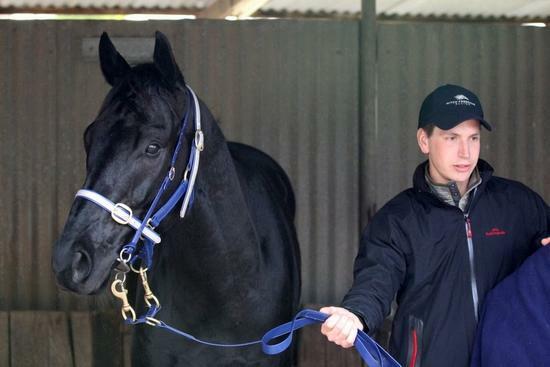 "He has settled into our new Ballarat stables so well and we have worked him out now. Since we've really trimmed him up and put a heap of work into him he has been racing in terrific form and he is in good spirits." Jarrod is now three wins from four rides on Geodesic and he was always happy during the race - "we were following the right horse in the run and he really seemed to relish the heavy going." "The horse is in really good form and when they keep winning they do build up a lot of confidence." Well and truly stamped in looks by his sire Domesday, Geodesic is the second runner and second winner for the stakes placed dual city winner Deraismes. Cheered on by owners around the country, Geodesic was warmly greeted back to scale by several who had made the trip to Bendigo including Lindsay and Desley Harm who had flown all the way from Brisbane just for the race. And they could not have been happier! "What a blast!" Lindsay enthused, recalling that as a fan of both Domesday and Deraismes he had a great feeling when Geodesic (who he named) came up for sale - "he screamed out to me buy, buy, buy!"